It’s a sad day when you realize you have worn out the elastic in a pair of underwear. There are some bits of clothing that should be upgraded before they get to that stage. Socks fall into this same category. When you get to the point that you have a toe sticking out, it means you overshot the expiration date by at least a month. This is very true. I feel like a buy underwear and socks almost weekly, and yet never have enough. Ya I used to have this problem with underwear, then I just stopped changing them regularly and wallah problem solved. Apparently, he also forgot to put on his underwear before putting on his shirt. That’s…. that’s really strange, Monsieur Hallbeck. I think that because he d put his pants on first, it threw off his whole “dressing rhythm”, hence him trying to get them on over his head. I knw I’m the same what if I put my left shoe on first, I have this hard time getting the right on one properly. My dressing rhythm gets messed up. Oh, and Chris, the word is VOILA, not WALLAH. same way*, I meant to say. Doing things in the wrong order week! I said, “This is Biff.” She said, “Biff hiding!” She sat, attentive, in my lap for 15 or so comics. 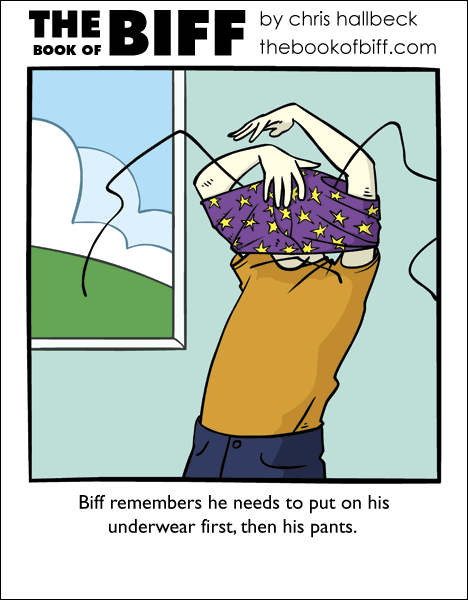 I think, compared to some other examples of Biff physics we’ve seen, pulling underwear (or even pants) on over one’s head is comparatively plausible. My mom has a picture of me, my brother and my sister with underpants on our heads. We’re apparantly finding the whole thing really funny. Maybe Biff’s hiding his face out of shame at his mix-up? Definitely looking like out-of-order week. Look a little closer at the positioning of the underwear: even when they somehow get to where they are going, they will be upside-down anyway. I declare, for Biff’s sake, Commando Tuesday. Thats the best I could come up with on such short notice. This is why Chris is the one with the website. @Speakerblast – I try to make it look easy but it’s all an illusion! “…first, then…” week. or just doing stuff out of order week. So it is out of order week! I smell pun…or…whatever you want to call it! My socks always wear a hole through the heel before I get a hole in the toe. If I wore tube socks I guess that wouldn’t happen but I can’t stand it when the seam doesn’t line up, so at best they’d only last twice as long. I just can’t pass up an opportunity to discuss my socks. @no name,is your name a reference to Gundam Wing? should be,that show was cool…..
Do I detect a shade of the shape of the arms of Ali again here? @ flashback: Maybe Chris meant not to confuse those who might be left wondering what the heck ‘voy-la’ means. Which in Spanish would mean ‘I go the,’ a phrase fittingly obtuse for this particular Tuesday. oO That means he’s commando right now. Oh my.